In this edition we detail the activities from the AMJV Management Board Meeting, a new study tracking the occurrence of bird-window collisions at an office park, and the release of outreach habitat supplements to accompany the Golden-winged Warbler Best Management Practice guidelines. The AMJV is excited to announce the launching of an interactive mapping application that partners can utilize to enhance landscape-level planning, coordinate activities for upcoming bird surveys, and report on annual accomplishments. Overall, the tool can create greater efficiencies in communication and use of resources to accomplish our conservation work. The Map and Forum Tracking Tool allows the AMJV community to post bird project information, follow on-the-ground conservation activities, and participate in discussions related to a specific location or project site within the AMJV boundary. The application fosters targeted discussions on bird-conservation activities by linking locations on a map interface to relavent comments and documents – field journals, photos, and spreadsheets. Partners can describe and identify where their on-the-ground conservation projects are taking place to provide valuable information for managers and researchers doing landscape planning. Field teams can create private forums to coordinate upcoming activities such as Golden-winged Warbler blitzes and Cerulean Warbler surveys. The beauty of the Map Tool is that it does not require GIS experience; anyone can use it. The AMJV Management Board met in Roanoke, VA on November 14-15 to hear updates on recent activities and accomplishments of the partnership as well as in-depth discussions regarding areas to focus collective conservation efforts moving forward. The two-day meeting began with staff presenting information on the process to update the AMJV priority species list and engaging State Wildlife Action Plan (SWAP) Coordinators to identify roles the Joint Venture can play in state birds conservation needs. Board Members were also informed on progress of the Cerulean Warbler Multistate project, accomplishments of the Working Lands for Wildlife program in creating habitat for Golden-winged Warblers, recent communication activities, and collaboration with the Appalachian LCC. On the second day of the meeting, AMJV staff and board members discussed ways for the partnership to get more involved in conserving wintering grounds of the highest priority bird species. This discussion was assisted by the great work that came out of the Partners in Flight V International Conference last August, which brought together geographic-based work groups to develop plans and projects focusing on addressing full life cycle needs of priority bird species. The meeting wrapped up with a roundtable talk on identifying science and implementation priorities and capacity needs for the Joint Venture as it continues to grow. We like to thank representatives from the American Bird Conservancy, Maryland Department of Natural Resources, National Audubon Society, Natural Resources Conservation Service, The Nature Conservancy, North Carolina Wildlife Resources Commission, Office of Surface Mining Reclamation and Enforcement, Ohio Department of Natural Resources, Pennsylvania Game Commission, U.S. Fish and Wildlife Service, U.S. Forest Service, U.S. Geological Survey, Virginia Department of Game and Inland Fisheries, West Virginia Division of Natural Resources, and the Wildlife Management Institute for their thoughtful insights and recommendations throughout the meeting. The next AMJV Management Board meeting is scheduled for May 22-23, 2014 in Roanoke, VA. Considerable research has been conducted in large cities with regards to bird collisions and high-rise buildings, but little on small office buildings and office parks. Researchers with the Conservation Management Institute (CMI) and the AMJV are overseeing a project collecting data to gain a better understanding of bird-window collisions at the Virginia Tech Corporate Research Center, where the offices for both CMI and the AMJV are located. Researchers and Virginia Tech University students – with majors ranging from dairy science to mechanical engineering – are surveying the grounds outside of office buildings to identify signs of bird fatalities due to collisions. An initial six-week survey during the fall migration recorded evidence of 28 bird collisions, representing 11 different species including Scarlet Tanager, Golden-crowned Kinglet, and Hermit Thrush. The project is expected to continue during the spring and beyond to get a better picture on the impact smaller office buildings are having on migratory birds year-round. Other goals of the research include identifying the most hazardous areas to birds, investigating factors that make areas more hazardous, and conducting test strategies to reduce collisions and reduce avian mortality. “For many of the students involved, they were not aware that bird-window collisions are a major problem. Now they see this as an opportunity to document the problem and bring about change,” said Rebecca Schneider, project manager with CMI. Schneider hopes to recruit more students for the spring and provide them with field guides to enhance their general knowledge of birds and aid identification. More information about the project can be found at: http://birds-and-windows.blogspot.com/. 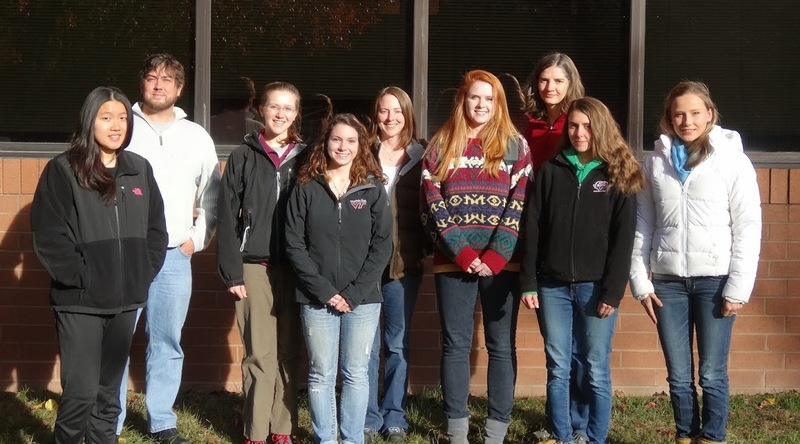 (Researchers and Virginia Tech student volunteers of the bird collision study; photo by Aaron Teets). The Golden-winged Warbler Working Group has developed 11 supporting Habitat Supplements for the Appalachians and Great Lakes regions to accompany Best Management Practice guidelines. 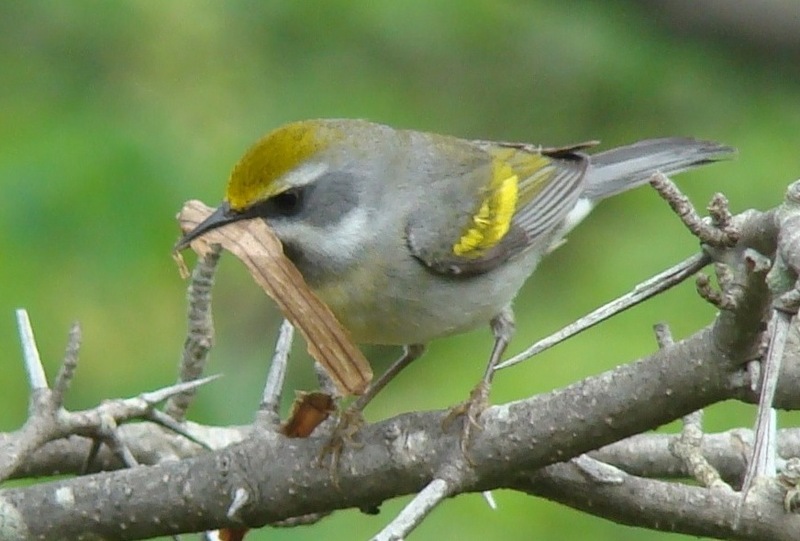 The supplements enhance guidelines used for the creation of Golden-winged Warbler breading habitat and are now available for use by land managers and landowners. They include information on all habitat types in the Appalachians such as Deciduous Forests, Minelands, Abandoned Farmlands, Grazed Forestland, Utility Rights-of-Ways, and Forest and Shrub Wetlands. The Golden-winged Warbler Working Group is comprised of over 75 U.S., Canadian, and Latin American ornithologists, conservationists, and managers from academia, federal and state agencies, NGOs, and industry. Their mission is to ensure the conservation of Golden-winged Warbler populations through sound science, education, and management. (Photo by Ed Burress, Audubon North Carolina). 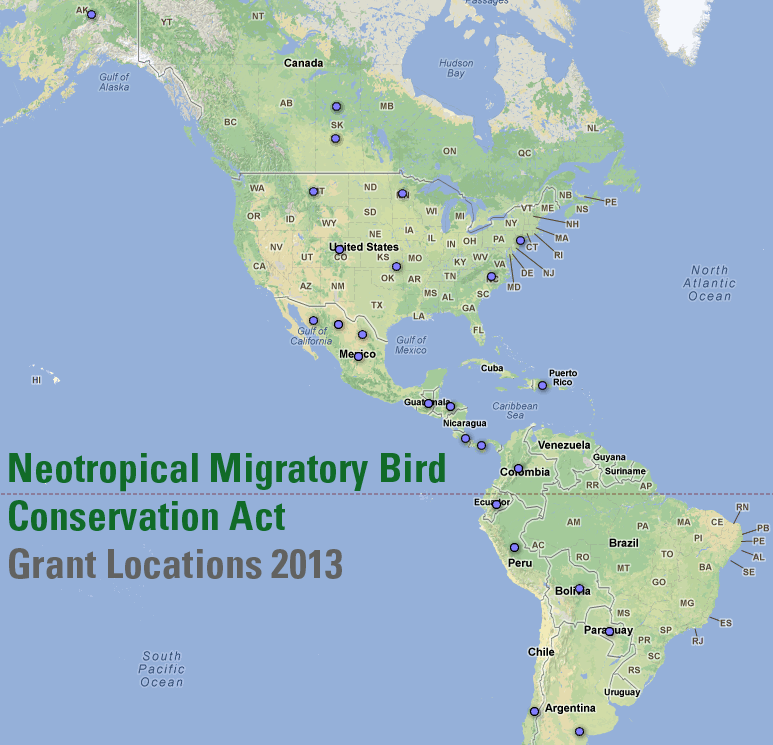 A Communications Toolkit for the Neotropical Migratory Bird Conservation Act is providing key messages, statistics, graphics, and other resources to partners and the media. It includes the Conservation Act’s success stories, which highlight achievements such as conservation plans of grassland birds, establishment of international private nature reserves, studying shorebird migrations, and more. In addition, the Neotropical Migratory Bird Conservation Act Communications Team - with representatives from the Association of Fish & Wildlife Agencies, American Bird Conservancy, Audubon Society, Cornell Lab of Ornithology, and U.S. Fish & Wildlife Service - developed messages detailing important facts and figures about the program for target audiences. Finally, a section on recent statistics highlights the economic value of birds and bird-related activities.